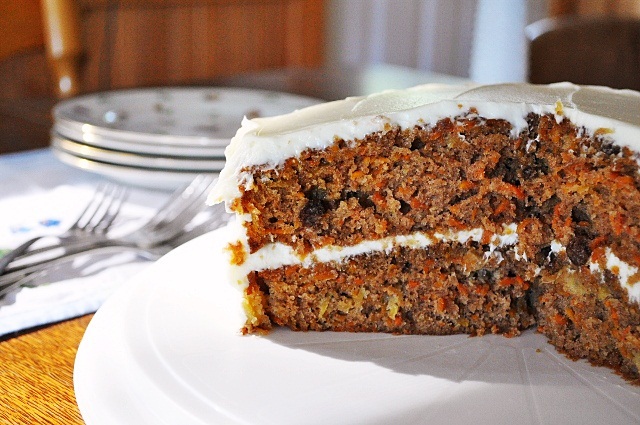 Carrot cake is my husband's favorite cake. I like it too, but I couldn't pick a favorite cake if I tried....all cakes are my "favorite". But he likes it so much that we ended up having carrot cake at our wedding! I don't make it nearly enough anymore, so as we were preparing to take a little road trip to my Aunt Judy's house in Maine last weekend I decided to make it and bring it along. We needed to put a little dent in our carrot crop from the garden after-all! Besides, I don't like showing up empty handed. I don't know where I got this recipe from, but it's the only one I've ever used. I've tweaked it some over the years, and so this is my final version. I just don't see any reason to try another recipe - this makes a dense, yet moist and flavorful cake. So why mess with perfection....right? Just as a side note - this recipe makes a 10" double layer cake, but often times I will use 2, 9" cake pans and pour the remaining batter into a cupcake pan (it'll make 6 cupcakes in addition to the cake). After the cupcakes are frosted I will wrap them and put in the freezer to enjoy at a later date. 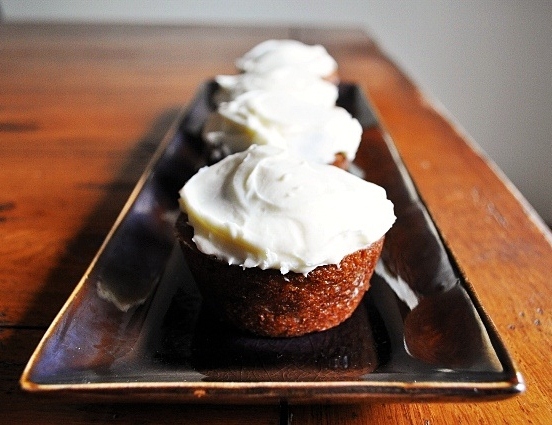 Cream Cheese Frosting - In a large bowl beat 1 1/2 blocks of softened cream cheese, 2 sticks of softened unsalted butter and 2 tsp vanilla together until creamy. Add 2 cups of confectioners sugar and beat until smooth. YUM!!!! It definitely does - I think it makes a big difference. Thanks for commenting & visiting!